Surfshark is a new VPN which is definitely making waves. For a newcomer, they offer a really strong service, although there is still some room for improvement. Works with US and UK Netflix. Surfshark is the latest newcomer to try and crack the hugely competitive VPN market. They have made an auspicious start too. Our tests found much to praise in their service already. However, there are still a couple of critical areas where Surfshark needs to improve before it can challenge the big boys. Their two-year offer claims to be based on a coupon offer but as this is generated automatically when you visit their website, this feels a little disingenuous. More likely they are heavily subsidizing their two-year deal to try and get more people to sign up for longer. As things stand, with the total price for a two-year deal almost £20 cheaper than a one-year deal, the two-year contract is a no-brainer. But be aware that rates could rise in the future. Surfshark offers a 30-day money-back guarantee as standard, so everyone has plenty of time to try their service before committing to spending any money. They accept all the major credit cards, several crypto-currencies, Apple Pay and, slightly more troublingly, Alipay too. Surfshark offers a choice between OpenVPN UDP and TCP, or IKEv2 protocols. These protocols are fine, however, on some devices you’re locked into specific protocols either due to the nature of the device or the design of the service. On certain devices, you can change between protocols although the option can seem a little hidden in comparison to the competition’s apps. In their support section, they list the information they don’t collect, which includes incoming and outgoing IP addresses, browsing, downloading or purchasing history, VPN servers you use, used bandwidth, session information, connection timestamps, and network traffic. They do admit to retaining users email addresses and billing information, but this is easy to anonymise using an anonymous email address and crypto-currency. Surfshark’s server network consists of 500 servers in 50 countries around the world. Server locations are mostly in Europe and North America, but there are also a smattering in Asia, Oceania, and South America as well as one in Africa and another in Central America. Such an amount is a pretty impressive offering for a newcomer to the VPN market. We also confirmed that these servers are all owned or rented and operated by Surfshark directly. Many new VPNs tend to piggyback their service on other providers, but self-owned servers should mean greater security for users. The trend in the VPN market has been moving towards offering more and more concurrent connections to subscribers. IPVanish recently upgraded to ten concurrent connections, while StrongVPN has gone to twelve. But Surfshark has taken things as far as they can go. They offer unlimited concurrent connections to all users regardless of which subscription package you sign up for. 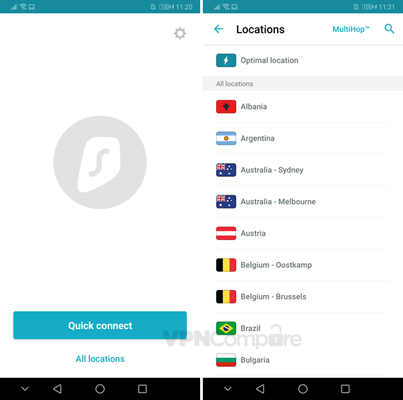 Unlimited connections is a great feature and means you can use Surfshark’s VPN service on all your devices as well as sharing them with your family too. 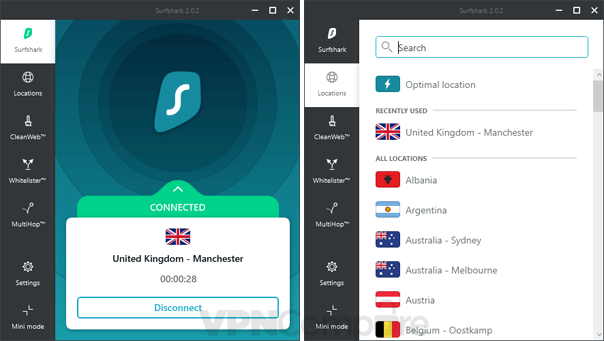 It is likely that all VPNs will end up offering unlimited connections in the end, but Surfshark is the first we know of to take the plunge. Their unique No Borders feature is an excellent little tool which actively looks to see if your network has any restrictions, such as state censorship. If it finds any, it automatically changes the location you are connected to in order to ensure you can access everything. This feature works on desktop apps, but Surfshark does admit that on mobile devices it may require manual setup to be fully effective. There is a built-in camouflage mode which helps to mask the fact that you are using a VPN from websites and even ISPs. There is also a Whitelister tool which allows you to specify certain apps and sites you want to bypass their VPN service. In common with many new VPNs, Surfshark also bundles in a tool to help you block ads, malware, and trackers. Theirs is called CleanWeb and from our testing, it seemed to do a pretty decent job. Surfshark even offers multi-hop connections, which divert your traffic through more than one server for additional security and privacy protection. 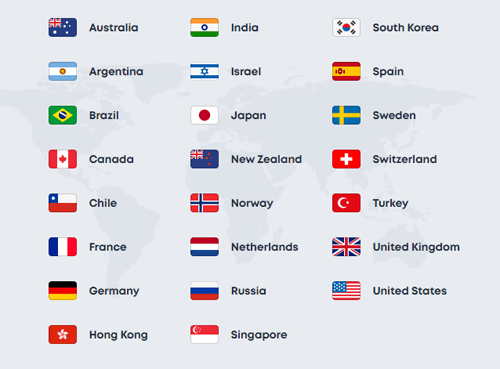 This is a popular feature only offered by a few select providers like NordVPN, so it is nice to see Surfshark offering it here. One beneficial feature of Surfshark is it works with both the American and British Netflix service. So you can switch between both to get access to a bigger selection of both movies and TV shows. Unfortunately, in our tests it didn’t work with BBC iPlayer so if you’re outside the UK or you just prefer to stream securely you’re out of luck on that front. We tested Surfshark VPN in China after reading some random reports that it worked there. Although Surfshark makes no such claims about the usability of the service in China. Unfortunately, after testing Surfshark on an Android device in China, we were unable to make any connection. As their Android app doesn’t have the option to use different protocols or ports, there was no way around this issue. All of the Surfshark apps are consciously minimalist in design. This is usually something to be praised but we did feel that Surfshark’s apps were perhaps a little bit too bare. Their mobile app is available for iOS and Android devices. We tested both the iOS and Android app. They were simple enough to download from the Apple app store and Google Play respectively. Once you have logged in, the app features a plain white design with the Surfshark logo prominent in the middle of the screen. There is a single-click quick-connect button at the bottom of the screen which connects you to the fastest available server for your location. Beneath that, the Change Location button opens up a list of servers which you can choose from. The settings icon in the top right corner directs you to optional features like the kill switch and CleanWeb. A few features are missing from the mobile apps, such as Whitelister and the multi-hop connections but, generally speaking, the apps are clean and reasonably straightforward to use. Surfshark offers apps for Windows, Mac, and Linux devices. We tested the Mac and Windows app, again they were simple enough to download and install. However, on the Mac app when we started to use it we found ourselves bombarded at regular intervals with messages asking for a password to permit access to confidential information. Such messages are always unnerving and while we did eventually find a way around the issue, it is something Surfshark need to resolve. We didn’t experience any similar issues on the Windows app and after login, it was plain sailing. Once in, the desktop app worked in much the same way as the mobile app. There was a white homepage with a quick connect button and options to access the server list, which also included the multi-hop servers. The settings button in the top right allows you to toggle the optional features on or off. As with the mobile app, there was nothing ostensibly wrong with this app, but the extreme minimalist wasn’t entirely to our taste. Surfshark offers apps for Linux users and a dedicated Amazon app which lets you use it with Firesticks and Fire TV devices. This is good news for Kodi users especially. There are also browser plugins available for Chrome and Firefox at the moment, but more could well follow in the not too distant future. At the moment, there are no apps available for Smart TVs or routers. But, Surfshark is still a young provider and deserve credit for getting as many decent apps live as they have. We assume further apps will also follow in the fullness of time. Surfshark’s speeds were on the whole pretty decent. But they were not perfect. Servers close to home performed well, and at distance there weren’t many issues either. For your every day internet use you won’t suffer any problems. Servers located further afield were understandably slower but not by much and would still be able to perform most everyday online tasks. Speeds were a little inconsistent over time which could prove to be an annoyance. We tested Surfshark on a regular UK household internet connection to try and gain an indication of the sort of average speeds you could expect. To do this, we accessed various websites and downloaded a test file using a regular UK household internet connection. Overall the speeds are impressive and comparable to some of the top providers. You should be aware this is merely a glimpse of speeds at a set time under specific conditions. Speeds achieved by yourself will depend on many factors and could be lower or higher than our results. Surfshark’s encryption is on a par with most premium VPNs on the market at the moment. They offer OpenVPN UDP and TCP and IKEv2 protocols and all use 256-bit AES encryption as standard with a SHA512 authentication hash and 2048-bit DHE-RSA key exchange. Surfshark is headquartered in the British Virgin Islands. Local laws here mean there are no requirements for Surfshark to retain any user data which should mean they are able to offer a trustworthy no user logs guarantee. As we noted above, the only data Surfshark admit to retaining is the email address you register with and the payment details you use. They insist all of this information is anonymised, but for privacy-conscious users, the revelation will still be troubling. Surfshark also says they may retain your IP Address when you visit their website and that their apps also collect advertising markers too. Much of this is standard practice across all websites, however, it would be beneficial if the text was clarified for their app usage. We concluded that your online privacy probably is secure with Surfshark. The service has had an independent audit carried out although this was limited to their browser extensions. While this is an excellent start, we would like to see this extended to their overall service. Surfshark is a new VPN and there is no doubt they have made big strides in an extremely short space of time. There is a great deal to praise about their service and they already put many more established providers in the shade. Their prices are competitive, their apps are easy to use, and they offer a great range of features. Their encryption is robust, their server network broad, and their unlimited concurrent connections raises the bar for the whole industry. But there are still a few question marks. Connection speeds were inconsistent during our tests and we still have a few questions over their privacy policies too. There is, however, no doubt that Surfshark is on the right track and they have the potential to be a significant player in the VPN market once they iron out the few glitches they have. Funded Post: VPNCompare has received one time compensation for the time spent physically testing and using this service. It has not influenced the outcome of this review. David has been writing for VPN Compare for well over 2 years and enjoys delving into the uses and privacy aspects of VPN apps. He's especially interested in unblocking sports allowing him to watch his favourite football team wherever he is in the world. Away from writing, he enjoys reading and politics. He is currently learning Mandarin too... slowly. Copyright © 2013 - 2019 TwistedFingers Ltd.
VPNCompare.co.uk is a trading name of TwistedFingers Ltd. | Registered in England & Wales | Company registration number 09558033. TwistedFingers Ltd. Bulloch House, 10 Rumford Place, Liverpool, L3 9DG, United Kingdom.